You can slice them and grill them…once that’s done you can use the grilled zucchini in sandwiches, on pizza, in pasta dishes, in frittata, or even just on an appetizer board with some really amazing cheeses and breads. You can chop them and stew them with a few other veg to make a ratatouille…and there are soooo many ways to use that. You can grate it and freeze it – then you’ll have grated zucchini whenever you want to make zucchini cake, zucchini muffins or just use it to add healthy “bulk” to your other dishes like frittata, pasta, meatloaf and so many other things (it hides well in food for those of you who need coercive measures to get your kids to eat vegetables). You can chop it up and make soup with it. You can zoodle it and pretend it pasta (not really, but kinda). You can chop it, blanch it and save it for the middle of winter when you’re craving a good ol’ summer dish. And how many lovers of fries do I have out there? Well, make some fries out of zucchini….yup you can do that!! But one of my favourite ways to make zucchini, when it’s summertime, is to stuff them. This dish is so versatile because you can eat it warm, you can eat it cold, you can eat it the next day, you can freeze it and reheat it for another day…seriously, the best dish ever! There is, honestly, not too many dishes that are seasonal, easy to prep and can be made ahead. Come on you guys…it doesn’t get easier that this!! Place the baking sheet with the zucchini halves in the oven and bake while you prepare the filling. Take the zucchini pulp and either hand chop it or chop it in a food processor. Add 1 tbsp oil on a skillet and cook the onion until soft; add the garlic and the zucchini pulp and cook until soft. Add the tomatoes and meat and continue to cook until well combined; re-season if necessary and add the pepper flakes. In a small bowl, mix the minced parsley with the bread crumbs; set aside. 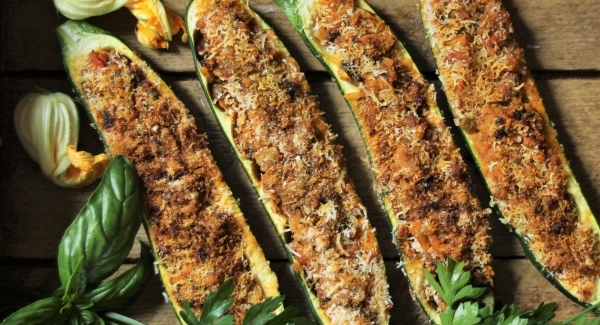 Take the zucchini shells out of the oven and fill them with the cooked filling; sprinkle breadcrumbs over the top and then top with grated cheese. Bake again for about 10-15 minutes until heated through and brown/crispy on the top. Serve with a fresh green salad and some great crusty bread!